We’d love your help. Let us know what’s wrong with this preview of Adventures in Paranormal Investigation by Joe Nickell. Tales of alien abductions, miraculous relics, and haunted castles have attracted believers and skeptics across the globe for centuries. 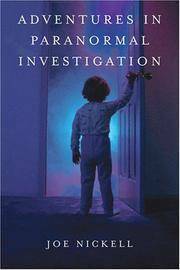 Paranormal investigator Joe Nickell tackles the world's most seemingly inexplicable myths in Adventures in Paranormal Investigation. With four decades of experience in the field, Nickell employs skepticism and scientific analysis to pull tr Tales of alien abductions, miraculous relics, and haunted castles have attracted believers and skeptics across the globe for centuries. Paranormal investigator Joe Nickell tackles the world's most seemingly inexplicable myths in Adventures in Paranormal Investigation. With four decades of experience in the field, Nickell employs skepticism and scientific analysis to pull truth from the mires of false evidence and trickery that surround both old and new legends and mysteries. Unlike authors who engage in hype and sensationalism in order to foster or debunk myths, Nickell approaches each case with a rational and scientific approach intended to find the truth. Occam's Razor -- all things being equal, the simplest solution is the best one -- is a principal instrument in his investigative toolbox, as well as the belief that it is the claimant's responsibility to provide the extraordinary proof required in such extraordinary cases. Adventures in Paranormal Investigation features Nickell's on-site explorations in unusual phenomena. Among the forty unique cases, Nickell examines mysteries ranging from snake charmers who purport to hold influence over the reptiles, to the Holocaust victims who reportedly haunt a gas chamber in Dachau, to Lake Simcoe's resident lake monster Igopogo in Canada. In addition to the case studies, Nickell analyzes how the propensity to fantasize can affect human perceptions of and belief in paranormal activity and how his personal experience with the paranormal was altered when intuition led to the discovery of a daughter he didn't know existed. To ask other readers questions about Adventures in Paranormal Investigation, please sign up. Nickell, a senior research fellow at the Committee for Skeptical Inquiry (Real-Life X-Files), relates short anecdotes about 40 years spent searching for the truth behind stories of psychic abilities, alien encounters, faith healing and other paranormal phenomena. As a former stage magician, private investigator and folklorist, Nickell has the right skills to separate truth from confabulation. Blurry photographs of ghosts said to haunt a historic Louisiana plantation or the gas chamber at Dachau are explained as photographic errors, if not outright fakery. Sightings of ghosts or religious figures in burnt tortillas most likely result from pareidolia, the ability to find shapes in random patterns like clouds. But Nickell's no-nonsense style fails to brings his stories to life. Confusion results from widely separated discussions of seemingly similar phenomena and from the inclusion of nonparanormal topics such as Jack the Ripper, the possible historical sources for Frankenstein and the fake cancer drug Laetrile. Finally, details are lacking on Nickell's Ghostly Encounters Questionnaire, which he claims shows that those who experience paranormal events have fantasy-prone personalities. Nickell's work is fascinating, but one wishes he were better at describing it. Short explanations of various phenomena he has researched. All them turned out to not be true (shocker! ), but he makes a big deal about he he is not a debunker of things like ghosts and UFO sightings, even though that is what he does. He seems like a very odd individual, quirky--he sometimes complained about being asked to investigate some reports, which is weird because that's his job. Overall, meh. A fun and interesting book on the skeptical research of the paranormal, but I could have done with a lot more detail on the actual case studies. I was disappointed by how short each section was. A collection of short magazine articles; not enough in-depth information for me to finish reading it. Joe Nickell doesn't believe in ghosts. I do. A former professional stage magician (he was Resident Magician at the Houdini Magical Hall of Fame for three years) and private investigator for a world-famous detective age Joe Nickell, Ph.D. (University of Kentucky, 1987), is Senior Research Fellow of the Committee for Skeptical Inquiry (CSI) - an international scientific organization - and investigative columnist for Skeptical Inquirer magazine.